Capacity is broken down into two categories, demonstrated peak capacity and design capacity. The demonstrated capacity is the highest levels observed in the past. It is not necessarily a maximum but rather a check to say, "we know it can handle X amount of gas." The maximum levels for each of the three storage areas were reached in 2009. Surprise! 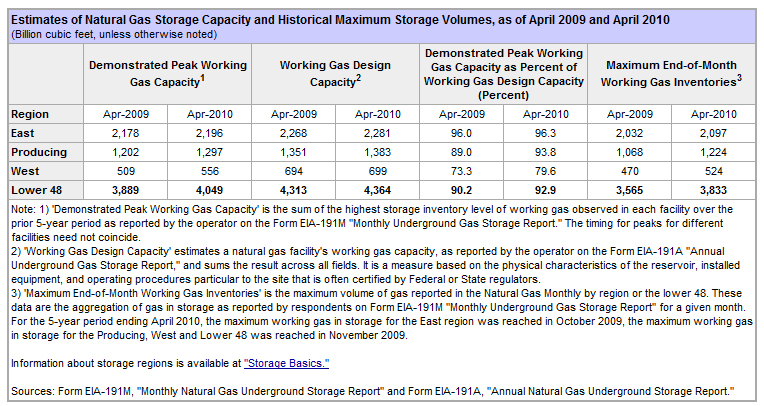 The design capacity is how much gas can theoretically be stored based on polling the storage operators. 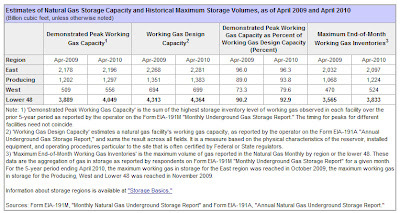 It is a theoretical number since the actual mechanics of storing natural gas involves lots of variables, so it's hard to know the exact capacity for sure. From a design capacity perspective, the upside is that there is 51 Bcf more storage this year than there was last year, a 1.2% increase. Unfortunately, only 13 Bcf was added in the East Region, which is the largest and got closest to being tapped out last year. The unfortunate thing about gas storage is that if one region fills up you are kind of stuck because the gas has nowhere to go and prices will likely reflect this reality. Hopefully we will be able to avoid last year's excruciating drama.